photo by Flickr user jslander, who has a whole ultra-mouth-watering Flickr set of LA cupcakes and thinks another LA cupcake bakery is "totally unnecessary:"
Do the owners of Babycakes (in NYC) really not know the over-saturated market they are jumping into? Maybe some of our LA friends like Tara, who runs the Los Angeles Cupcake Meetup Group, can share their thoughts on this. 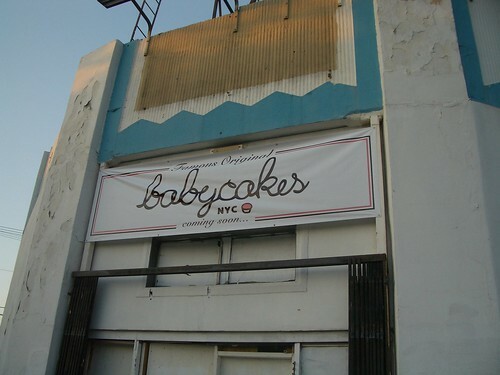 The rumor mills have been churning ever since BabyCakes NYC’s sign was removed from the building on Spaulding and Beverly. Some believed we were scared off by Los Angeles’ red tape. Others thought we just didn’t feel like opening up anymore. Both were wrong. BabyCakes NYC is still moving to West Hollywood, but, now, we won’t be doing it alone. The bakery, slated to open June of 2008 at 7501 Beverly Boulevard on the corner of Garner, will share the renovated "Tire Town" space with denim designer, Earnest Sewn. They've also got these new boxes available, which they call "cupcake insurance" - so cute! We are pleased to present our new, cupcake insurance boxes. Inserts hold your cupcakes in place and keep them safe en route to your party, restaurant, house or wherever. Also, they'll be closed on Monday, February 18th and Monday, February 25th. The market is indeed saturated here in LA, but I can't think of another bakery in town catering to those with food allergies and health concerns, so I say WELCOME, Babycakes!